Canadian iron-ore developer Black Iron says high-grade iron-ore pellet product should sell at a premium for the next few years, resulting in attractive project economics for its planned Shymanivske project, in the Ukraine. A deadly dam burst in Brazil on January 25 has lit a fire under iron-ore prices, after Vale was forced to take 11 mines off line, impacting on 70-million tonnes a year of production. 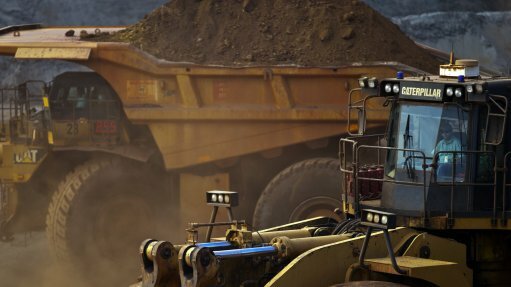 This resulted in iron-ore prices spiking to $87/t for benchmark 62% iron content fines and to $101/t for 65% iron content ore.
Black Iron states that while there are conflicting views on how long the 62% iron content benchmark will stay at elevated levels, it notes that there is consensus that premium for higher iron content products, more specifically iron-ore pellets, will be increasing for at least the next few years. “High-grade iron-ore and pellets cannot be easily replaced by other miners as doing so requires substantial investment plus time to permit and construct suitable production facilities,” says Black Iron CEO Matt Simpson in a letter addressed to shareholders. He notes that the higher pellet prices should improve the project economics of the Shymanivske project, which will produce pellet feed containing 68% iron. A 2017 rescoped economic study is based on a benchmark selling price of $62/t and a 68% iron content selling price of $97/t. The study estimated that the project will have an after-tax net present value of $1.7-billion and an internal rate of return of 36%. The project will be repaid in 2.9 year. A capital investment of $436-million is required for a four-million-tonne-a-year Phase 1 operation, and a further $312-million to double capacity to eight-million tonnes a year. In the second half of last year, Black Iron had hosted several companies at the site as part of their due diligence to fund a portion of the Shymanivske project’s construction in exchange for the pellet feed that the mine will produce. At the end of 2018, Black Iron said that it hoped to announce a commercial arrangement early in the New Year. The Shymanivske project contains a 646-million-tonne measured and indicated mineral resource, consisting of 355-million tonnes measured mineral resources grading 31.6% total iron and 18.8% magnetic iron, and indicated mineral resources of 290-million tonnes, grading 31.1% total iron and 17.9% magnetic iron, using a cutoff grade of 10% magnetic iron. Further, the Shymanivske project contains 188-million tonnes of inferred mineral resources grading 30.1% total iron and 18.4% magnetic iron.